How Can Reliability Analysis Impact Your Company’s Bottom Line? While reliability investigations can be expensive, they can also add value to a product that far exceeds its cost. 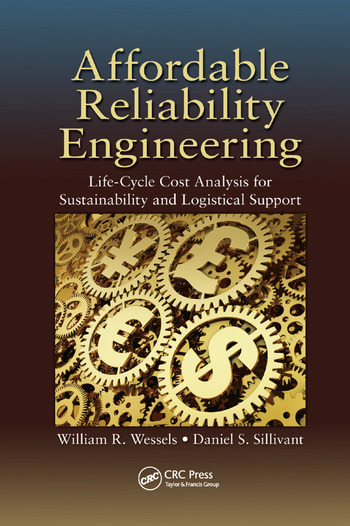 Affordable Reliability Engineering: Life-Cycle Cost Analysis for Sustainability & Logistical Support shows readers how to achieve the best cost for design development testing and evaluation and compare options for minimizing costs while keeping reliability above specifications. The text is based on the premise that all system sustainment costs result from part failure. It examines part failure in the design and sustainment of fielded parts and outlines a design criticality analysis procedure that reflects system design and sustainment. Providing a framework for managers and engineers to develop and implement a reliability program for their organizations, the authors present the practicing professional with the tools needed to manage a system at a high reliability at the best cost. They introduce analytical methods that provide the methodology for integrating part reliability, failure, maintainability, and logistic math models. In addition, they include examples on how to run reliability simulations, highlight tools that are commercially available for such analysis, and explain the process required to ensure a design will meet specifications and minimize costs in the process. Affordable Reliability Engineering: Life-Cycle Cost Analysis for Sustainability & Logistical Support focuses on reliability-centered maintenance and is an ideal resource for reliability engineers and managers. This text enables reliability professionals to determine the lowest life-cycle costs for part selection, design configuration options, and the implementation of maintenance practices, as well as spare parts strategies, and logistical resources. Bill Wessels has over 45 years of experience in system design and sustainability. He currently works at the University of Alabama in Huntsville, where he cofounded the Reliability and Failure Analysis Laboratory and performs basic and applied research in design-for-reliability, reliability-based maintainability, and reliability-based life-cycle economic analysis. Wessels has a BS in engineering from the United States Military Academy at West Point, an MBA in decision sciences from the University of Alabama in Tuscaloosa, and a PhD in systems engineering from the University of Alabama in Huntsville. He is a registered professional mechanical engineer and a certified reliability engineer. Daniel S. Sillivant is a researcher at the University of Alabama in Huntsville performing basic and applied research and investigations in reliability life-cycle modeling for aviation and sensors systems. He is published in peer-reviewed proceedings for the International Mechanical Engineering Congress and Exposition; Reliability, Availability, Maintainability Workshop; and Industry, Engineering, and Management Systems. Sillivant has a bachelor’s degree in chemical engineering and a master’s degree in industrial/reliability engineering from UAH. He has begun his dissertation research in reliability based life-cycle economic modeling for implementation of reliability-centered maintenance. In addition, he holds certificates in Lean Concepts Training and Six Sigma Green Belt. "… an excellent reference book … written in an interesting and different way than traditional reliability books. The focus on economics of reliability will be welcome by both engineers and managers. … The book is based on many years’ experience of the authors and the coverage reflects the importance and priority and needs of industry. I will share more of these thoughts with my students in class." "… provides technical information and facts that will help improve the communication and understanding of important reliability life cycle concepts and principles among fellow technical and managerial professionals. … will attract the well-deserved attention of the expert and novice alike. The focus on life-cycle cost analysis brings to the engineering community something new and significant that helps to better underscore important role of reliability analysis in the in the total life cycle process." —Dr. Russell A. Vacante, RMS Partnership Inc.